$21.8 billion was invested in 2Q 2015, another post-crisis record. 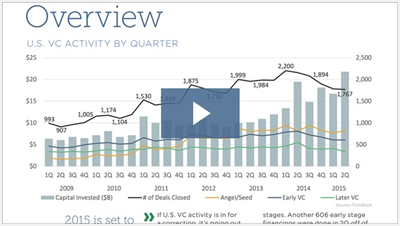 Despite this, deal flow has steadily decreased since 1Q 2014. Median Series A and B valuations have increased to $15.1M and $41.4M, respectively. Median Series D+ valuations are at an all-time high ($184M). 32 startups entered the realm of unicorns through August of this year. This number nearly eclipses last year’s record high of 33. Click here to download the full report for free, click here.